Orangutans, found only in rainforests on the islands of Borneo and Sumatra, are one of the smartest species next to humans and there are many interesting facts about these intelligent animals. The reason why they are so similar to humans is that about 97 percent of their DNA is exactly the same as ours. When in the presence of humans, they have been known to copy what they see them doing. For example, in studies, Orangutans copied humans who performed a task such as combing their hair, starting a fire or creating a hammock to the point where the Orangutans were able to learn from their own mistakes. It is also believed that Orangutans can communicate with language at the ability level of a three-year old child. Below is a a list of more interesting information about Orangutans written for both kids and adults. Click here for a great selection of Amazon.com books about Orangutans. Some of the human-like qualities Orangutans have shown include the ability to give and receive gifts, play video games on computers, problem solve, learn from past mistakes, learn sign language, and manufacture tools. Orangutans are known for their ability to create both simple and sophisticated tools to help them with daily activities. They use sticks to catch bugs, leaves as protection from the rain, and even fashion fly swatters. In much the way humans pass down customs and traditions from generation to generation, Orangutans do also. It is believed that they learn vocalizations and communication from one another as well as skills that are sometimes unique to a certain geographic area. Although not as long as humans, Orangutans have a long life span. In captivity they can live up to 50 years and several years less in the wild. The gestation period for a female Orangutan is about nine months, just like humans. Orangutans are tree-dwelling mammals that spend most of their time above ground in the trees. They build their nests in trees where they tend to eat and sleep. When they do come down on occasion they transition from swinging through the trees to walking on all four appendages, called quadrupedalism. Orangutans are mainly herbivores that feed on fruit, bark, honey, plants, vines, flowers and sometimes small insects. Rain water collected in tree holes and fruit provide the necessary fluids. With less than 60,000 total Orangutans left in the world, they are considered to be endangered to critically endangered. Humans are the main reason for their drastic decline over the last several decades with deforestation and agriculture taking away more and more of their land. Because female Orangutans spend so much time raising their young, they only give birth every 7 to 9 years. Each of their offspring will stay in their nest for 7 to 8 years to be raised solely by the mother. Of all of the great apes, the Orangutan is the most solitary. With the exception of breeding, adult males live a solitary life with little mingling among them. Orangutans differ in color from Chimpanzees and Gorillas. They have a lighter reddish-brown coloring instead of a darker brown-black color. 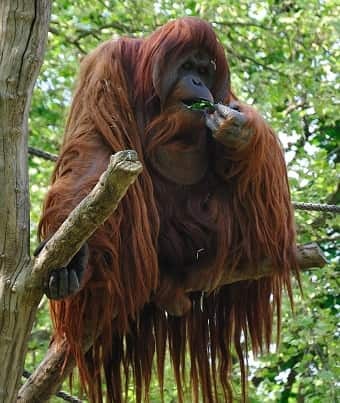 Orangutans have characteristic hairless faces, proportionately small ears, round eyes and long arms that reach up to eight feet (2.4 meters) across.